I made these two projects in the 2nd year of my engineering. This was more of an introductory exercise for me than anything else. My main aim was to get a hang of the things like wires and soldering irons while making something that has some serious practical application. While searching for something worth making on the net, I went for these two projects because they had the potential of being put to practical use in my home. Imagine the excitement of turning on/off bulbs, tube-lights, fans etc. while relaxing in front of the PC! Water alarm was more of a necessity in my three-storied home though. Every evening somebody (that somebody’s me) had to walk all the way up to the roof to check if the tank is filled or not. This was not only a waste of time and energy but also it led to a heavy water wastage almost everyday because that ‘somebody’ was a bit too lazy at times. Currently, water alarm has been put to excellent use in my home and I am proud that through such a simple circuitry, we have been able to save thousands of liters of water in the last three and a half years or so. Unfortunately, the home appliance control circuit, though functional, couldn’t be implemented because it required some serious tweaking with electrical lines in the house. Watching the relay ‘twitch’ when the key was pressed was fun nevertheless! 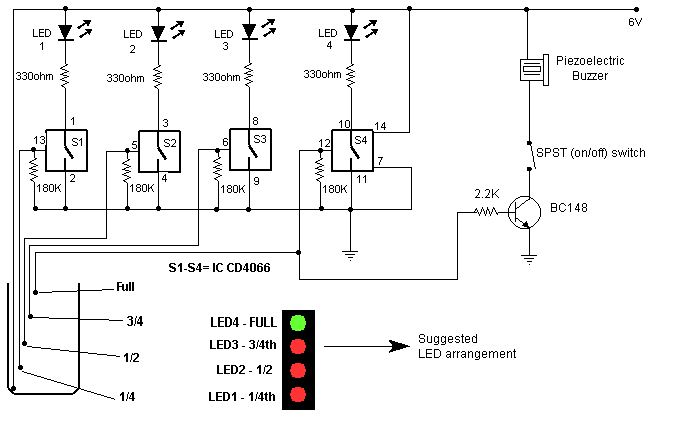 Below is the description of the circuits involved and the simple software for the home appliance control project. Build them yourself and have fun! The interface circuit given below along with the given software can be used with the printer port of any PC for controlling up to eight equipment . If value=29(decimal) = 00011101(binary) → D0,D2,D3,D4 are ON and the rest are OFF. It should be noted that the circuit below not only indicates the amount of water present in the overhead tank but also gives an alarm when the tank is full. I kept things simple by using only one LED and the buzzer to show that the tank is filled up. 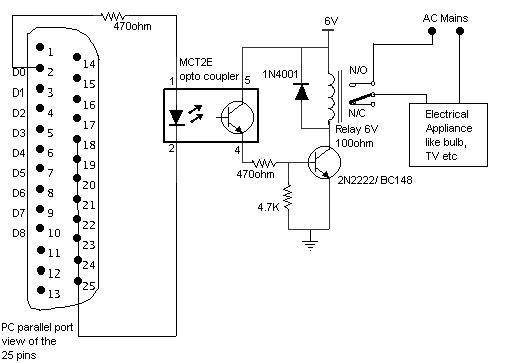 You can implement the full circuit if you want. When the water is empty the wires in the tank are open circuited and the 180K resistors pulls the switch low hence opening the switch and LEDs are OFF. As the water starts filling up, first the wire in the tank connected to S1 and the + supply are shorted by water. This closes the switch S1 and turns the LED1 ON. As the water continues to fill the tank, the LEDs 2 , 3 and 4 light up gradually. The number of levels of indication can be increased to 8 if 2 CD4066 ICs are used in a similar fashion. This entry was posted in Academic, Second Year, Utility and tagged BC148, CD4066, Home Appliance Control, outportb, Water Alarm. Bookmark the permalink.